It's snowing, so let's keep things nice and easy today, eh? Here's a really quick, reasonably healthy, spring-invoking snack. It's kind of a non-recipe — I haven't prescribed amounts for any ingredient, though I did include an ingredients list. It's all quite flexible. 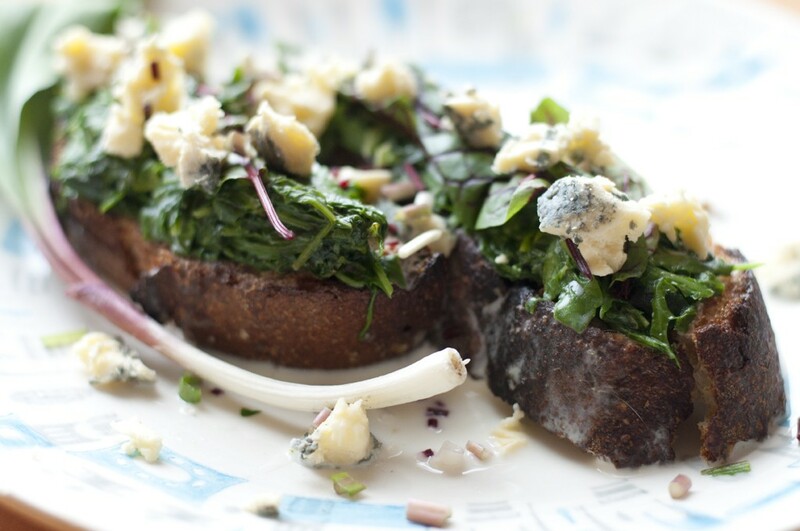 The idea is simple: toast your bread, douse it in buttermilk and pile on as many wilted greens, fresh herbs and blue cheese as you like. And, of course, eat it. Cut a nice slice of crusty sourdough — perhaps Red Hen Baking Co.'s pain au levain or something similar — and toss it in the toaster. Heat a splash of olive oil in a skillet until it's blistering hot, then drop heat to low and add a big handful of chopped greens. Maybe some spicy spring arugula from Fairfax's Riverberry Farm? Dandelion greens from your lawn or baby kale will work, too. Just make it something with a little heft. Maybe you've been out in the woods and brought home a few wild leeks? ’Tis the season! Chop one or two and throw them in. Scallions, chives or some other green allium will do fine, a well. Sprinkle salt, stir well and sauté until the greens wilt but aren't totally melted. When your bread is toasted, put it on a plate and pour a liberal amount of buttermilk (I used about a quarter cup of Mountain Home Farm buttermilk) on it. Mound the greens on top and add a few leaves of tangy fresh sorrel from Finn & Roots's super-nifty aquaponic farm in Bakersfield, and blue-cheese crumbles. I used Lady in Blue — a rare treat only available in spring from Westfield's Lazy Lady Farm, but any blue will do. Dig in! Pro tip: If you did the buttermilk right, you'll need a fork and knife.